First, I want to promote my friend Ivan Sorensen's Indigogo campaign for Hammer of Democracy, a WW2 set of rules adapted from his squad hammer set. Just for the record, even though I am the co-author of Trench Hammer, I am not benefiting from this and have thrown my hat (and cash) into the ring. Please give it a look, I have never supported a crowdfunding campaign, but I know this one will be a good one! Another go with Trench Hammer this weekend, this time with the wife! She is long-suffering and the best spouse/opponent a guy could ask for. She is usually convinced I am cheating, but was willing to dive in and give Trench Hammer a try. We played a simple British attack on a German-held village, circa mid-1918. The Germans had 2 grenadier section with bombs, an MG08/15 LMG section, and an MG-08 Maxim HMG. The British had a standard platoon with a Rifle Section, Bombing Section, Lewis Gun Section, and Rifle Grenade Section. Here we have the initial setup, with the German defenses arrayed and the British skipping down the road. The Bombers chase the Germans out of the wood, while the Rifle section decides enough is enough and is out fo action. The Bombers have completely secured the wood at the top of the picture, after knocking out the German MG08/15 squad. The Rifle Grenadiers are thrown back when the German bombers sally out of the village to assault them. The Bombers get in close and force the Maxim team on top of the hill to fall back. Here is the German commander, sad at her defeat.. the Bombers manage to infiltrate the village from the flank. This is a narrow British victory, but the butcher's bill is high. The Britsh lost their platoon leader, rifle section, and Lewis section and are incapable of further offensive action at this time. The Germans lost their platoon leader, a Grenade squad, and an LMG squad. After the British infiltrated into the village and the Maxim pulled back, the remaining combat effective German squad was forced to fall back or face being cut off. A great game we played in 45 minutes! She likes it and we will be playing more. I hope you enjoyed it and contribute to Ivan's new rules if you can. Until next time, good gaming! Lt Klink leads with the Stossgruppe against the Lewis Gun section. They knock out the section but are disorganized (5 hits) and the rest of the platoon passes through them while they sort themselves out. Lt. Klink is seriously wounded in the action and his senior NCO takes charge and leads the Grenadier squads through. A British suffer from several turns of terrible activation rolls, so are only able to bring on the reinforcing bombing squad after the hun is well into their position. The lead German squad manages to bomb the British rifle grenade section in the sap out of action. The reinforcements from the adjoining unit are met by one of the German Bombing squads. The melee is intense and the Germans wind up with 4 hits and barely drive off the enemy. Back at the T junction of the trench, the trailing German Grenadier squad gets into a grenade fight with the British Bombing section for a couple of turns. Once again, the combat is bloody (the Germans take 5 hits) but they manage to rout the British. Meanwhile, the lead German Grenadier squad clears out the rest of the sap. Given that there are no combat effective British units on the table, the Germans has enough time to blow the sap and withdraw back across no man's land as planned. So a major success with fairly moderate casualties. Lt. Klink is carried back by his men and will spend several weeks in a field hospital in the rear having his wounds attended to. I hope you enjoyed it. The game took exactly 31 minutes to play, I know because I listen to a podcast while playing it, but I also played it solo, which speeds things up quit a bit. When playing scenarios involving trenches, the gamer will find one of their biggest limiting factor is how he represent trenches on their table. I use rather large rubber trenches, really designed for 15mm FOW bases. As a result the trenches don’t have what I consider enough bends and kinks as an actual trench would to prevent enfilading fire and protect from shell blasts, so some abstraction is in order. Your mileage may vary, these rules are for my peculiar circumstances. As soon as you have succeeded or are driven off, fire a green flare and more artillery fire will cover your withdrawal. You troops enter at point A on the map. Your Platoon is being used as coolies to dig a sap for the Special Brigade to conduct one of their infernal gas attacks. It will only encourage the Hun to plaster you with shells while the Special Brigade detachment heads back to the comfort of the rear, so you are not terribly happy with this. You and your Bombing Section are located off map at point C. Reinforcements consisting of an assault section can be had from the neighboring company, and enter the table at point D.
· Every turn you may choose to save activation points each turn instead of activating a unit. They may be saved from one turn to the next. At the beginning of each turn you may choose to spend the points, roll a d6 and if it is <= the number of points, you and your Bombing Section arrives at point C and may activate this turn. The next turn the assault section will arrive at point D with 1 leader. Don’t let the Hun ruin your labor! I hate having my squads drag dice around with them to indicate hits, so I am using unit cards to track them. 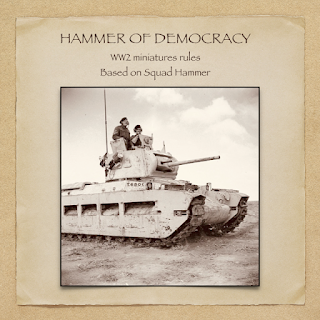 There are only 4-8 units on the table in a typical game, so this should never be too much of an issue in Trench Hammer. Here is the German force, it has a Leader card with the leader rules and a card for each unit that tracks hits with a red paperclip and includes any special rules for that unit. The QRS I use now can be found here, it can be pretty small as I have offloaded some of the rules to the unit cards. After I get them painted, I intend to also use casualty markers, 1 for when a unit reaches 3 hits and a second one for 5 hits, so I remember to apply the negative damage modifiers. This should leave a fairly uncluttered table. Next time I will actually play the game and we will see of Lt. Klink can deliver a blow to the British. Note this is not the same Klink as Just Jack's, but his ditant cousin, Just in case I get him killed off, we won't have any temporal paradoxes. I christened my gaming space this evening with a quick game of Trench Hammer. I played (again) the first training scenario from Stout Hearts and Iron Troopers, a British Infantry platoon attacking a German strongpoint. In the background, you can see the Hun in his trench with 2 Rifle Sections, 1 Maxim HMG, and 1 Officer, a young Lt. Klink. In the foreground is the British platoon forming up behind a small hill. From left to right you have: Rifle Section, the platoon commander, the Bomber section, the Lewis Gun section, and the Rifle Grenade section. The plan was to send the Lewis gun team to the top of the hill and suppress the left rifle squad, send the rifle grenades to the shell hole to keep the Maxim gun under fire, and maneuver the Rifle section and bombers to roll up the German position. What actually happened was the Rifle Grenadiers were put out of action by the Maxim gun, but the Lewis Section did manage to lay down some suppressive fire. The Rifle Section and Bombers received some fire as the maneuvered around. The Rifle Section and Bombers made it to the Hun trench and assaulted while the Bosche swung his other rifle gruppe around to counter attack. It was touch and go with the Germans holding out for some time, but eventually, they succumbed to Mills bombs and bayonets. The Bombing Section was exhausted and unable to continue, though, after subduing the enemy and were out of action. The Rifle Section meanwhile dealt with the flanking Germans. And here is the end game, with the Rifle Section in the Hun trench about the assault the Maxim position from the flank, Lt. Klink decides discretion is the better part of valor and pulls back to regroup the survivors of his platoon. The British have carried the day, but at a cost, with the platoon combat ineffective as the Bombers and Rifle Bombers need to be rallied and reorganized and wounded sent back to the aid station. They are unable to continue the attack and will be passed through by another platoon. And here is a better shot of mt total workspace. The grey boxes on the top shelf hold my 28mm buildings and the spool cotton box is from my Great-Great-Grandfather's roadside store. Thanks for reading and until next time, good gaming!